The Journey on Steemit for @Hilarski and @AnaHilarski. In August of 2016, we were first introduced to the Steemit social media platform by our friends Jeff Berwick @DollarVigilante and Sterlin Luxan @SterlinLuxan. After netting a whopping $5200 on my first post on Steemit I was hooked. Here is my first post, “Hi My Name is Randy Hilarski AnCap and Crypto Marketer.” According to the Steemitboard Hilarski page, I have made over 1,100 posts on the Steemit social media platform. Steemit is a blockchain-based blogging and social media website, which rewards its users with the cryptocurrency STEEM for publishing and curating content, and is owned by Steemit Inc., a privately held company based in New York City and a headquarters in Virginia. - From the Steemit WikiPedia Page. Unlike the mainstream social media networks like Twitter, Facebook and Instagram a blogger on Steemit can actually earn rewards for their content. These rewards come in the form of cryptocurrency. STEEM is a cryptocurrency based on the social media and content-focused Steem blockchain, which was created on March 24, 2016, by Ned Scott @Ned and the blockchain developer Dan Larimer @Dan. With over 1.2 million registered accounts and a daily volume of more than a million signed operations, Steem is amongst the five blockchains with the highest level of activity In terms of total market capitalization, STEEM is currently ranked at place 43, with a market capitalization of more than 148 million USD. From the Steem WikiPedia Page. What is SBD or Steem Dollar? Steem Dollars are a stable coin on the Steem blockchain. Payouts on Steemit are priced in USD and paid out in Steem Dollars. If your post earns $1 you will receive 1 SBD. You can choose to receive 50% in 7 days and 50% to Steempower or 100% to Steempower. Steempower is the amount of Steem you have staking in your account on the Steem blockchain. It is similar to a savings account. Your Steempower is what gives you voting power on the Steem blockchain. The more Steempower you have, the more your vote is worth. For example at the time I write this article I have about 7,700 Steempower which gives me an upvote of $.15. I can vote 10 times per day. Powering down is the action of taking your Steem out of Steempower. If you want to power down your coins staked in Steempower it will take 13 weeks. You can start and stop a power down of your account any time you want. As with any cryptocurrency Steem and Steem Dollars are real money. This means you need to take measures to protect your account. When you first sign up you will be given an ACTIVE OWNER KEY. I recommend copying this master key down on paper and putting it somewhere safe. When using Steemit use the least powerful key you have to accomplish the action you intend to do on the platform. The owner key gives full control over your Steem account. Its user is able to post, vote, transfer funds, vote for witnesses, and change all keys including being able to change the owner key. The active key can perform almost all functions for an account except change the owner key. It can change all other keys on an account, including the active key. The active key can do everything the post key can do, plus allows transferring, trading, powering up/powering down Steem Power, and voting for witnesses. The posting key allows accounts to post, comment, vote, and follow other accounts. This is what most users should be logging in to Steemit with every day, only using the active key when something to do with transferring funds or changing keys is necessary. Borrowed from, “A User's Guide to the Different Steem Keys or Passwords” by @PFunk. Buying and Selling Steem/Steem Dollars. If you are like me you will probably want to buy some Steem to get your Steemit account going. When I first began back in 2016 I think I bought about $500 worth using Bitcoin. This guide is simply about Steemit and the Steem cryptocurrency so if you want to learn how to use Bitcoin you can visit 99Bitcoins.com. Simply click on the link in your Steemit account that says wallet. Click the drop-down arrow. Click buy and the link will take you to Blocktrades. It will look like below. 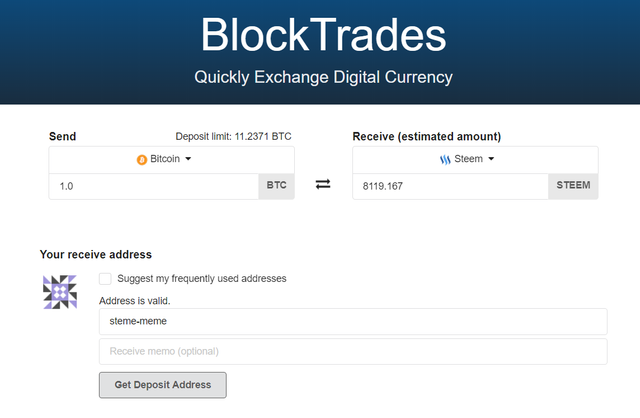 Choose how much Bitcoin worth of Steem you would like to buy and send the Bitcoin to the address provided by @Blocktrades. Your account name will populate automatically. You can see the account I used @steme-meme. If this is your first Bitcoin transaction I recommend you send a small amount. Now that your Steemit account is up and rocking it is time to learn the basics and etiquette of the platform. Remember this is Social Media so you must be social. It is a common practice on Steemit to make an #IntroduceYourself post. In the tags section of the post make sure to add IntroduceYourself all one word. Tell us about yourself. How you found Steemit. Where you are from. Tell us what you are passionate about. This way you can find like-minded people on the platform. Don’t forget to mention me @Hilarski. I will make sure to stop by, follow you and give you an Upvote. Things To Do on Steemit. Blogging, Vlogging, art, and photography are all welcome on Steemit. Also, don’t forget to participate by commenting, upvoting and resteeming articles you like. Resteeming is a simple way to show someone you like their content. Make sure to tell them in a comment that you Resteemed their article. Who knows, you might make a new friend or garner some upvotes. Things Not To Do on Steemit. Plagiarizing is highly frowned upon on Steemit. This is the quickest way to ruin your reputation. Your reputation score, in the beginning, is fragile so safeguard it with quality content. The @Cheetah account bot and @SteemCleaners are vigilantly watching. If you use content from another source make sure to give a citation with a link to the original content. It is ok to embed videos from Youtube and even use photo’s but make sure to use the original with the link. For images simply right click on the image and copy the image address and paste it into Steemit. The image will automatically show up. Do not claim that the image is your own, provide a citation. If your post is a paid post make sure to let your audience know that the content is a paid endorsement. Simply put at the bottom of the post, “This Post is a Paid Endorsement”. Be careful using the Down vote feature. This feature on Steemit is one of the hottest topics regarding the platform. You have the power to take earnings away from a user on the platform. I only use the downvote when I believe the user is plagiarizing or they are using the platform to smear the reputation of another user. It is ultimately up to you how you use the feature but remember Karma is watching. The greatest thing about Steemit is that you can build your own platform on the Steem blockchain and many people have done exactly that. Here I am going to list some of the other platforms you can use to make your Steemit experience even better. Busy.org- @Busy If you would like to use an easier interface for your blogging and still have all of the features of Steemit I recommend Busy. I highly recommend it for anyone new to blogging and those of you who are used to using platforms like Medium. Partiko- @Partiko By far the easiest way to use Steem. This mobile app is my favorite application on the Steem blockchain. I use it to publish images, comment, resteem, upvote and check on my earnings. 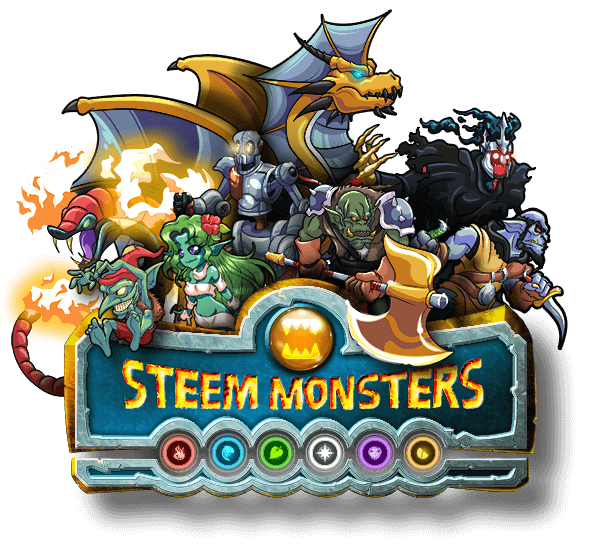 Steem Monsters- @SteemMonsters @Aggroed Do you like games like “Magic the Gathering”? Then this game is for you. I play it almost daily. I expand my card deck, collect rare cards, compete in tournaments and I am even able to sell my excess cards for Steem! Magic Dice- @MagicDice How about games of chance? I play Magic Dice daily and try my odds at winning a stack of Steem tokens. Steemboard- @SteemBoard Keep track of your advancement on the Steem blockchain. Steemboard provides badges to mark your progress as well as your stats. SteemBotTracker- Would you like to boost your posts on Steemit. This is a quick way of getting votes. Pay the bots to vote on your behalf. SteemConnect- If you would like to play the games above or use platforms like Busy then SteemConnect is your way to securely access the Steem blockchain with your account on third-party platforms. Don’t Forget to Follow These Accounts on Steemit. If You Enjoyed This Article Don’t Forget to Share It With Your Friends and Welcome to Steemit! can be found on the @CryptoDailyUK News Site and is Published to Google News. Thank you for the Resteem! Thank you for this valuable article. New steemit users like me learn alot with this writing. @hilarski purchased a 98.19% vote from @promobot on this post. You got a 28.20% upvote from @brupvoter courtesy of @hilarski! Magic Dice has rewarded your post with a 66% upvote. Thanks for playing Magic Dice. This post has received a 78.52 % upvote from @boomerang. Your UA account score is currently 6.810 which ranks you at #113 across all Steem accounts. In our last Algorithmic Curation Round, consisting of 325 contributions, your post is ranked at #28.